We had quite a big turnout this week at IpBoG. Five tables were full of board gaming goodness. I arrive to find people playing Biblios, Machi Koro, Dead Of Winter and Saint Petersburg, which made it's IpBoG debut. 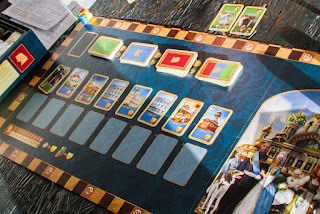 This week I played Age of Assassins, Sushi Go and Quartermaster General. It was my first time playing Quartermaster General, a game the only really works with six players, and we had the full compliment of people. It's set in world war two where three people are playing as the allies with the other three playing as the axis. I was Germany and so destined to lose. Mike did mention that he'd played it five times and the axis had lost every time, so the odds seem stacked in the allies favor. Quite aptly, on the final turn, I lost control of Germany and Russia removed all my troops from the board. I saw other people playing Chinatown, Hanabi and Liar's Dice. As always I'm sure a bunch of other games were seen that I missed.